British label, Vinyl Solution, celebrates its 25th anniversary this year by making its entire back catalogue available digitally for the first time. The anniversary is spearheaded by the re-release of Bizarre Inc’s classic ‘Playing With Knives’. Released on 28 July, the track has been reworked by Utah Saints, Drumsound & Bassline Smith, Timothy Allan & Mark Loverush, and Magnus J, who are helping to introduce the track to a whole new generation of electronic music fans. 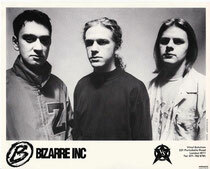 Bizarre Inc was initially formed by Dean Meredith and Mark Archer in Stafford in 1989. Archer moved on to form Altern 8, and Dean was then joined by DJ/producers, Andrew Meecham and Carl Turner. ‘Playing With Knives’ was originally released in 1991 but, like many tracks of the time, it was a club anthem but didn’t initially chart, it eventually reached No.4 when it was reissued after the chart success of their follow-up ‘Such A Feeling’. A subsequent single, ‘I’m Gonna Get You’, reached No.2 the following year followed by their debut album ‘Energique’. Vinyl Solution was founded by J. Saul Kane of Depth Charge (also the label’s A&R), Alain De La Mata and Yves Guillemot, boss of the Vinyl Solution record shop on Portobello Road. The Notting Hill based label hit initial success with acts Depth Charge, Eon & Rio Rhythm Band, before Bizarre Inc’s ‘Playing With Knives’ became an instant rave anthem. Other artists on the label included Stupids, pioneering Britcore rappers, Gunshot, The Senseless Things, Subject 13 and Jon Roca aka Midi Rain.